Is a Lifetime Fishing License a Good Idea? You are here: Home / Frugal Living / Is a Lifetime Fishing License a Good Idea? I live in northern Minnesota where fishing and exploring the great outdoors is a huge part of the culture. Each year we dutifully buy our fishing licenses so that we can legally fish the 10,000+ lakes of Minnesota. After all, you can give a man a fish and he eats for a day, but you can teach a man to fish and he’ll eat for a lifetime. The state of Minnesota offers lifetime fishing licenses (among others) – meaning you pay one big chunk of money and never have to pay again for the rest of your life. The idea intrigued me, so I took a closer look to see what the benefits would be. The biggest perk to the lifetime fishing license is that it is good for your entire life – regardless of where you live. So if I were to buy the lifetime license and later move to California, I could still fish legally when I came back to visit relatives in Minnesota without having to purchase a more expensive short-term, non-resident license. But unfortunately, you still have to “renew” the license each year – no fees, mind you – but you still have to go through the hassle of annual paperwork. And unlike the annual licenses, there is no option for a husband and wife license. Each of you would need to purchase an individual lifetime license. So, like any good money-saver, I did the math on whether or not a lifetime fishing license made sense for me and my husband (I’m 35 and he’s 30). If we were to get a combined husband/wife fishing license each year for the next 40 years of our lives, based on the current rates, we would spend a total of $1,000. This, of course, does not take into consideration that the annual license fee can (and probably will) increase over time. A lifetime license for both of us would cost $766. My next consideration was the kids. They don’t even need a fishing license in Minnesota until they turn 16 years old, but the younger you are when you get a lifetime license the cheaper it is. If we bought our 5-year old a lifetime license right now, he would save at least $703 over the course of his lifetime. 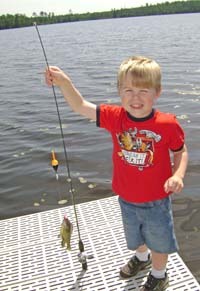 Our twin 3-year olds would each save a minimum of $766 with a lifetime fishing license. So from a money standpoint, if you really enjoy fishing, the lifetime license is a good deal. But there are so many unknowns, that I’m not sure this expense would be a smart choice for our family. While we love to eat fish, we don’t get out on the lake as much as we’d like. How much would we actually fish? Who knows what our health will be like in 15, 20 or 40 years? A lifetime is a long time, and for all we know, the state of Minnesota could make a lot of changes to the whole licensing system. In addition, our children may not like to go fishing when their older, or they may even leave the state and rarely come back (gasp!). And then there’s the whole apocalyptic idea that during their lifetime our environment could get so bad it wouldn’t be safe to eat the fish anymore (okay, that’s unlikely, but still). In the end, I think our kids would be better served by us tucking away the money we would’ve spent on lifetime fishing licenses into interest-bearing savings accounts that they could use toward their college education. What do you think? Would you consider a lifetime fishing license? It’s too much money, I’d go with investing the money instead. Interesting, I did not even know such a thing existed! I will be watching the comments – I LOVE the idea of paying for something once and being done with it (although, annual renewal does stink a bit), plus, it would be great for the kids. Considering my husband, Eli, fishes about every other day year-round (seriously…not even kidding), a lifetime license was a very wise investment for him when he got his about 10 years ago (it was definitely before we were married). I should probably get one, too, because I’m going to be getting a fishing license every year, anyway. As for our kids, we’ve talked about getting one for each of them when they turn 16. Eli (my husband) is planning to take the kids fishing as much as possible. Maybe what we’ll do is give them the choice of a fishing license or something else once they turn 16. My kids might not like fishing as much as my husband does. We’ll see. While my husband and I won’t be getting any lifetime licenses for ourselves, we are planning on getting a lifetime combination license for our daughter prior to her third birthday. Same as you, we did the math but, of course, it’s pretty difficult to predict how much the costs of these licenses will go up over the years. I suspect our savings will be better than what we initially thought. You may have already done this in your math — but — $766 dollars today is worth a more in 40 years. How much would you have in 40 years if you invested that money today? Just playing with some ballpark figures here, so I’ll use round-ish numbers. Bankrate.com says the average return on a 5 year CD is 1.71% APY, so let’s use 1.5%. If you invest $766 today in a 5 year CD at 1.71% APY for 5 years, you’ll have $825.20 (I used an interest calculator located here http://www.bankofinternet.com/interest-calculator.aspx ). Invest that for another 5 years at the same APY (which brings us to 10 years out), and you’ll have $888.97. Another 5 years (15 years out), $957.67. Another 5 (20 years), $1,031.68. Again (25 years), $1,111.41. Again (30 years), $1,197.30. Again (35 years), $1,289.83. And one last time (40 years), $1,389.51. So, that lifetime fishing license doesn’t really cost $766 — it’s more like $1,389.51, just not all today. My numbers may be off (there’s a good reason I did not become an accountant! ), but that license costs more than just the amount you hand over today. In NC a hunting lic. is 350.00 or less if the child is less than a year old. My dad bought that as a gift for my son. I think if you can purchase these for a child very young it is worth it. And even if they don’t hunt or only do it a few times, it can def be worth it! You all make some good points…. While it would increase the cost of the lifetime license, I do like the idea of waiting until the child is older (like 16) to see if they actually show an interest in fishing. If your waiting until the child gets older better 15. The cost goes up at age 16. My father actually bought one for my 3 year old son. We hope he will fish as much as his Papa does, but he really thought it was a good idea.